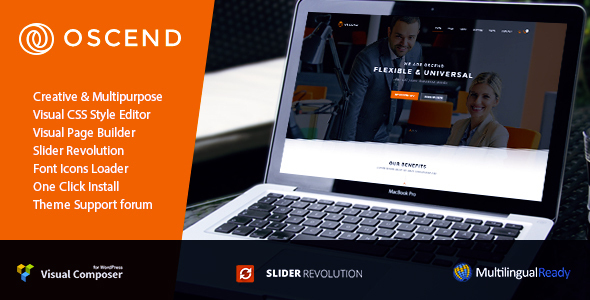 OSCEND PLUSE GET NOW $39 Oscend is a stylish and modern template for business websites Any firm strives to win the clients by demonstrating its activities, products, services and sharing the latest news. Strict but beautiful Oscend template intends to achieve a high efficiency of your business and gain the maximum profit by using these strategies . FREE AND UPDATE INCLUDED !!! How update premium plugins in our themes ? Note: All images are just used for Preview Purpose Only. They are not part of the theme and NOT included in the final purchase files. Compatible with WPML, Visual Composer 5.1.x, Visual Composer 4.12.x, Visual Composer 4.11.2.1, Visual Composer 4.11.x, Bootstrap 2.3.x. Oscend has been tested with browsers IE9, IE10, IE11, Firefox, Safari, Opera, Chrome, Edge.